If you love to eat, Griffith may become your new guilty pleasure. Part of the region known as ‘the food bowl of New South Wales’, this inland city is simply bursting with delicious food inspired by its large Italian population. But there’s more to do in Griffith than eat. Known for its wine, wilderness and local arts culture, Griffith has lots of activities in store for the curious visitor. Book from our range of Griffith hotels and dig in! The traditional home of the Wiradjuri people, Griffith was established in 1916 and designed by Walter Burley Griffin, the same architect who designed Canberra. His passion for tree-lined streets and radial patterns show up in the town in areas like Benerembah Street. Griffith was declared a city in 1987 and now has a population of almost 18,000. Along with other Riverina towns like Wagga Wagga, it’s responsible for growing nuts, rockmelons, onions, pumpkins, carrots and more. Hungry yet? Gorge yourself on some delicious Italian pizza or pasta at a local cafe, or take some fresh produce home from one of the gourmet delis. You may have been to wine regions before, but Griffith is the largest in the country and turns over 400,000 tonnes of grapes into wine each year! Get a piece of the action with a winery tour that will have you drinking famous drops like De Bortoli amongst the pleasant, peaceful vineyards. Time to get back to nature? Take a day trip to Cocoparra National Park to wander pine forests with rocky cliffs, birds and wildflowers, or head to Murrumbidgee Valley Nature Reserve to wander the red river gums along the river bank and maybe even spot a koala. For a cultured time, drop into the Griffith Regional Art Gallery and take a walk around the polished timber floors as you check out both local and touring exhibitions. Griffith Regional Theatre has 520 seats and a program to satisfy every taste whether you’re into theatre, comedy, cabaret or dance. Visit Pioneer Park Museum to see over 40 historical buildings in the middle of the bush, or the Italian Museum to find out all about the town’s Italian heritage by checking out a variety of relics from pioneer families. Keen to get going? Griffith is 570kms from Sydney and 450kms from Melbourne, and if you don’t want to drive you can get there by plane or train from Sydney. Wot are you waiting for? 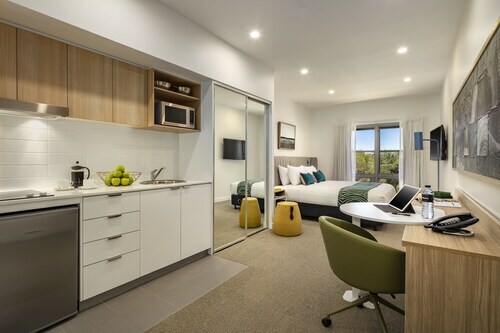 Book your Griffith accommodation with us for an all-you-can-see, all-you-can-do, all-you-can-eat experience. How Much is a Hotel Room in Griffith? 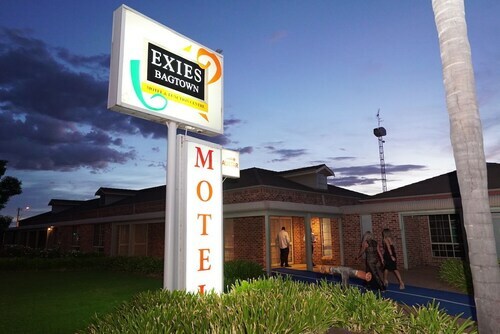 Hotels in Griffith start at AU$108 per night. Prices and availability subject to change. Additional terms may apply. Had a pleasant stay, p[perfect location for our needs, friendly staff. Comfortable bedding and clean bathrooms.